Granite is, by and large, the most popular natural material for countertops. In fact, granite countertops in Spokane Valley have become almost a standard in new home constructions, and tend to be the go-to choice during any kitchen upgrade. People choose this material for a number of reasons, but if you’re deciding whether you want granite or quartz countertops in Spokane Valley, or are considering another material, here’s what you should know about using granite in your kitchen. First, it’s important to understand exactly what this material is. Granite is a naturally occurring stone that is quarried in countries all around the world. It is an igneous rock, which means it is formed from the gradually crystallization of magma beneath the earth’s surface. This makes it an extremely sturdy and durable material. Every slab of granite is entirely unique. Even slabs cut from the same section of a quarry will have different patterns and color variations in the stone. In a way, a slab of granite is much like your own fingerprints; they might look similar, but in reality, each one is unique. Granite comes in a wide range of colors, from neutral grays and browns to rich reds, blues, and greens. The colors appear in small flecks or crystals for a more uniform look than the swirling patterns of marble. 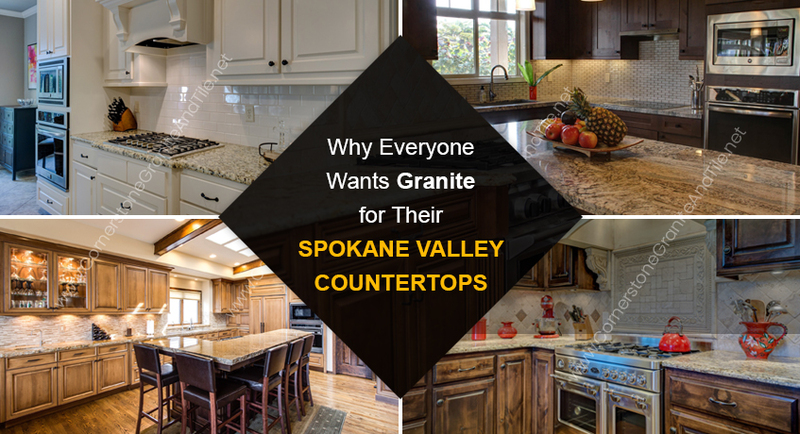 Most people who weigh the pros and cons of granite countertops in Spokane Valley find that the pros greatly outweigh the cons. However, each person’s needs are different, so be sure to take all these factors into consideration when making your decision. The exact cost of Spokane Valley granite countertops is going to vary widely based on the quality of the slab you use, the color of the granite (with blue being the most expensive), the thickness of the slab, the edge treatment, whether or not you want a backsplash in the same material, and other important factors. The cost for the granite itself can range from $10 per square foot up to $170 per square foot, while installation and fabrication costs can vary between $40 and $100 per square foot. Ultimately, you want to get a professional quote on your granite countertops in Spokane Valley. However, it’s important to note that Spokane Valley granite countertops are generally among the cheapest stone countertop options available. Both marble and quartz countertops in Spokane Valley will cost you more. First, please don’t try to install granite on your own. This is an extremely heavy material that is difficult to manage and requires professional expertise. You need to work with a business that specializes in Spokane Valley granite countertops. It’s also important to know that your cabinets will need to be installed before the slab can be cut. You will need precise measurements from the cabinet surfaces to ensure a proper fit for your granite countertops in Spokane Valley. If you’re replacing an old countertop and keeping your original cabinets, note that the cabinets may need to be reinforced in order to support the weight of the granite slab. Once the granite has been cut, it will be carefully installed, and checked to ensure that the slab is perfectly level. You should then have it sealed, to help prevent stains and make the granite more resistant to oils. If you’re considering getting granite countertops in Spokane Valley, contact us at Cornerstone Granite and Tile. We are experts in handling granite and many other stone countertop materials, and provide exceptional service, affordable prices, and unbeatable workmanship on every project we handle. Contact us today to get a quote on your granite countertops. Many customers ask us, as leading suppliers of granite countertops Spokane, to help them add value to their residential and commercial properties with granite installations. Whether you are looking to improve your home or public coffee shop, bar, restaurant, nightclub or hotel, a stylish and well-chosen granite countertop is a status symbol and style statement which will boost its value. With commercial premises like those mentioned, adding the right kind of granite countertop will not only add to the resale value of the property, its beauty will also help to attract and retain customers. Don’t just take our word for it, ask a local real estate agent, they will confirm that a granite countertop in a Spokane property is a selling point, just like a swimming pool or an elegant front aspect which enhances ‘curb appeal’. People are always contacting realtors and ask to view homes with granite countertops in the Spokane area within a certain price range. Granite has been a popular construction material since 2,000 BC when it was used in ancient Egypt to build and decorate many of the earliest pyramids. Since then granite has been in demand for palaces and upscale homes, and more recently granite has been used to decorate skyscrapers like the cladding on the Willis Tower in Chicago and for the entrance lobby floor of the Empire State Building in New York. So, if you put a granite countertop in your property, fear not. You are following an established tradition that goes back nearly five thousand years. * People love the elegance of granite installations. * Granite is affordable because supplies are plentiful. * It keeps its value, so you should expect to get a three-fold return on your investment in terms of the price enhancement to your property. * Granite is low-maintenance, tough and long lasting, it will outlast the building that it’s installed in. If you would like more insight about getting a granite worktop for your Spokane property, feel free to come and talk to us. We have sample granite slabs to look at, and before-and-after photos of some of our many granite countertop installations in the Spokane area. Our granite countertop installers cover a 50-mile radius around Spokane, Washington State, including Deer Park and Spokane Valley. We also install granite countertops in these Indiana locations: Coeur D’ Alene, Hayden, Post Falls, Rathdrum and Sandpoint. As the go-to information resource and supplier for granite countertops in Spokane, we often notice how amazed our customers are at the choice of colors available. Many people expect granite countertops spokane to be in natural stone colors, and the majority are, as you can see around homes or commercial premises in Spokane like bars, nightclubs and hotels. Of course, we supply and install beautiful granite countertops in standard shades, be we also install some amazing colors too. The wonders of nature mean that during the formation of granite from molten rock in the earth’s crust, the granite lava can become colored by diverse minerals like iron and titanium and all types of colored crystals. This results in a veritable granite rainbow of blues, greens, pinks and yellows. Indeed, people may have mistakenly thought a bright red or blue countertop they have seen as being quartz, composite or laminate, when it was pure granite, quarried from the earth’s crust in countries worldwide. One of the standard color palettes for granite countertops in our Spokane showroom is soft whites, ash grays and beige tones. Being neutral, they blend with other colors and won’t clash with anything. These colors are a safe play, they please most people, or at least don’t offend them. So, there should be no problems when the time comes for you to sell your property. If you want to add color accents, the splashback can be colorful, and easier to change by a new owner if they don’t like it. You can also add splashes of color with accessories like coffee pots and mugs in bright primary colors, with the added benefit that you can take them along when moving to a new property. Orange, brown and gold colored granite countertops are favored by customers in Spokane who want to usher in a luxurious, palatial impression. These colors blend well with natural wood tones, whether they are light or dark wood finishes. Gold granites, or granites with gold flecks and swirls, form a stunning complement for accessories like gold-plated or real gold faucets and mirror frames. Bright and bold pink, red and burgundy granite countertops are seen around Spokane in domestic settings and commercial premises like beauty salons, spas, juice bars, ice cream parlors and coffee shops. These tones promote feelings of childhood, feminine beauty, vibrancy or romance, depending on the shade. For a science fiction, space-age look, blue granite is an ideal material. It goes well with acrylic panels and blue LED lighting. Used in some of Spokane’s bars, nightclubs and trendy boutiques, blue granite surfaces are complemented with accessories in transparent acrylic, or in colors like blue, black or white for contrast. Another high-tech favorite is black granite. We get asked for this mainly by male customers, both young and young-at-heart, who want to create a stark, minimalist look for granite countertops in their home or their commercial premises like barbers, music studios, vaping shops or showrooms for cars, trucks and motorbikes plus associated services like vehicle wrapping, spraying, pinstriping and custom trims. If you would like to explore color options for your project, feel free to pop in to our showroom for granite countertops in Spokane. We will be pleased to let you have the benefit of our experience in a free consultation, during which you can view samples of the different colors we have available for your project. If we don’t have a particular color we can order it from our suppliers. Our granite countertop installers cover a fifty-mile radius around Spokane, Washington State, including Deer Park and Spokane Valley. We also cover these Indiana locations: Coeur D’ Alene, Hayden, Post Falls, Rathdrum and Sandpoint, where we have installed many granite countertops for residential and commercial premises. Which type of countertop is right for you? When you invite family members or friends into your house, it’s only courteous to offer them a drink. Offer hot coffee or tea on a cold day or a refreshing glass of iced tea or spring water on a hot summer’s day. As your guests follow you into your kitchen, the first thing they lay their eyes on is your countertop. They won’t notice if your refrigerator has a computer screen with an internet connection or if your stove includes a convection oven. The focal point of their view will be your countertop. Countertops come in all shapes, sizes, colors, materials, and durability. Each countertop has its good points and its bad points. So which one is right for you? Marble is a popular option for countertops. The igneous stone is beautiful and elegant and comes in a variety of colors. You can choose the typical white or black, but marble also comes in rose, yellow, green, and gray. Since no two slabs of marble are alike, your countertop will be unique. Marble stands up well to hot pots and pans. It’s also a popular choice for fireplaces since the occasional spark won’t mar it. With its artistic appearance and uniqueness, marble is a beautiful choice for a countertop. When choosing a marble countertop, a customer needs to keep a few things in mind. Firstly, marble is porous. That means that it may absorb liquids, which can cause staining, but with a few simple precautions, your marble countertop will be beautiful for years. First of all, be sure to seal your marble countertops when installed and every few years after that. It’s also a good idea to wipe up spills immediately and even place a napkin or coaster under a “sweaty” drink. Another thing to keep in mind is that marble can chip or crack. Sharp knives can cut into marble, and a heavy mug or pot can even chip off a corner. Always use a cutting board on beneath any food you’re cutting and try to avoid dropping objects onto the counter. Another option is granite. Granite has a rich beauty all its own and comes in many shades to compliment your kitchen. Granite doesn’t scratch easily, but it will surely dull your knife. Granite stands up well to normal wear and tear, as well as heat, and, when sealed properly, it’s stain resistant and won’t absorb liquids. Granite countertops may be beautiful, but they need to be sealed properly. Depending on circumstances, this could be as often as once a year. Granite is porous, so if it isn’t sealed properly, liquids could leave a permanent stain. Ceramic tiles are another choice in the kitchen. Ceramic countertops have an elegant look all their own, and they come in almost any color you can imagine. A ceramic countertop can be basic, but if your installer is somewhat artistic, he can create a beautiful pattern to compliment your room. While ceramic countertops can be inexpensive, one problem is that the tiles can crack. Broken tiles can’t be repaired; they must be replaced. Due to the variance in colors, it’s a good idea to reserve some of the leftover tiles from the original job so that the color will match. So which countertop is right for you? The decision can be tough, but the experts at Cornerstone Granite and Tile can help! With fifty years of experience under our belt, we can help you choose the right countertop for your kitchen and then install it. In Washington state, we happily serve the people of Spokane, Spokane Valley, and Deer Park. In Idaho, we cater to customers in Coeur D’Alene, Hayden, Post Falls, Sandpoint, and Rathdrum. Give us a call today to see what we can do for you! Granite is composed of interlocking mineral crystals and the most widely recognized are feldspar and quartz. Be that as it may, a variety of different minerals can be included, and these make every piece of granite unique. Feldspar is the white element you often see in granite, the light gray streaks are quartz, while the black is usually mica. Granite is bored, shaved and blown up out of quarries in huge blocks, and exceptional milling machines then cut it into workable sizes. Normally, a slab is about 4 to 5 feet wide and between 7 to 9 feet in length. The materials are being polished into a unifies thickness by other machines, which is normally about 75% of an inch to 1/4 inches (2 to 3 centimeters). Transforming raw granite into countertops needs unique tools. Granite countertop Spokane can be specially crafted and skillfully installed, although it is obtainable in precut and edged countertops. The design of your kitchen, the shapes, the size the precut materials that are available and the seam’s place are what will determine if you will use edged countertops and precut or if what you need to use is customized installation. In order to shape the thick material, a standard home skill saw should be changed with a diamond stone cutting blade. You can get this at main home enhancement centers. Experts have a method they use so as to avoid shaving the edge of the granite, which can be caused by the blade’s vibration. At the point when granite is cut dry, a lot of dust is accumulated. Some installers make use of a handheld diamond- bladed circular saw with a vacuum connected to it to reduce the untidiness. A curve diamond blade is required to cut out curves that are like sink openings. The design of the countertop’s edge can be cut in many ways: rounded, curved, flat or slanting, but cutting the edges might be difficult so they are perfectly equal or accurately meet in a corner. If you don’t have to produce the granite countertops by yourself, you can call for the service of Spokane granite countertops to get the work done for you. You need a pro to give you the most amazing and sparkling granite countertops you can ever imagine. Corner Stone Granite and Tile! Are you looking for a granite and tile for home improvments? Ideal for Countertops , Exterior Decks , Fireplaces , Flooring , Masonry Works , Showers , Water Features , Water Proofing . Please call (419) 827-8663 (we are available 24/7) or write at Info@CornerStoneGraniteAndTile.net.